Synergist Saddles was created as a result of founder John Di Pietra’s frustration with not being able to get features in a saddle that he thought were important. In the year 2000 the business was handed down to Dave and CJ, his son and daughter-in-law. Along with Dave and CJ, Julieanne, CJ’s cousin, as well as her sister, Sharon, all contribute to making Synergist Saddles the saddler of choice for many top riders. Through the sport of endurance racing, John learned first hand what worked and didn’t work in saddle design. Master Leatherman Ton GoodMaster leatherman Tom Good joined the team in 1994 and is now considered part of the family. Dave and CJ had both worked previously with corporations that had grown so large that they had lost touch with their customers. 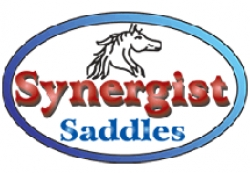 Synergist Saddles is a small family business that is able to take care of your saddle needs on a personal level. When you call us you will talk to a family member who cares about you and what is important to you. You will always be greeted with a warm, friendly attitude.